Aviation giant Boeing is set to acquire 80% of Embraer’s commercial aviation department for $3.8 billion. Last week, the long-awaited Boeing and Embraer deal finally took off after receiving the go-ahead from the Brazilian government. According to the terms of the agreement, Boeing will acquire 80% of Embraer’s commercial aviation department for $3.8 billion, a move set to transform Boeing into the global market-leader for small and medium-sized passenger aircraft and intensify competition in the sector. Besides holding on to the remaining 20% stake of the new joint venture, Embraer will remain in full control of its Defense & Security and Executive Aviation divisions. After a few months of turbulence, the deal now enters a safer course. On July 5th, 2018, Boeing and Embraer signed a preliminary and non-binding agreement, committing to the creation of a joint venture and other basic premises. However, in December, a Brazilian Federal Court granted an injunction to a lawsuit filed by four congressmen from the Worker’s Party, effectively blocking the deal, even though Embraer declared it essential to its survival. 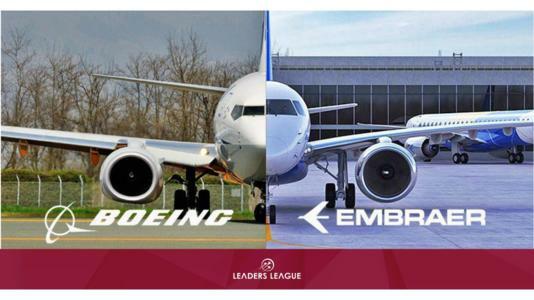 Another injunction, linked to a class action suit filed by Embraer’s labour union, was granted a few days later, however, both were quickly revoked, marking two legal victories for Boeing and Embraer. The next challenge would be the approval of the Brazilian government which owns a golden share in Embraer and thus has the right to veto the deal. Newly-elected President Jair Bolsonaro and his team had indicated their support for the high-profile deal even before assuming office, but, in January, National Security advisor General Augusto Heleno said the government was reviewing if the agreement needed amendments, adding the new administration was not thinking of interrupting negotiations. Mr. Bolsonaro would later express concerns about a provision allowing Boeing to acquire 100% of Embraer’s commercial aviation division, describing the aircraft manufacturer as important Brazilian patrimony. Notwithstanding, a few days later, he sanctioned the tie-up between both companies and ensured they would maintain current jobs in Brazil, a move to appease politicians and union workers critical of the deal. The deal will be voted by Embraer’s private shareholders by mid-February and, if approved, Boeing and Embraer will have to obtain regulatory approval in several countries. Minority shareholders with legal complaints against the deal will also have to be heard over the coming months. Despite the aforementioned challenges, the two companies released a statement estimating that the deal should obtain final regulatory approval before the end of 2019. Both parties additionally agreed on the creation of a defense joint-venture (51% Embraer, 49% Boeing) to accelerate the sales of Embraer’s cargo plane KC-390 and to include a new assembly line for the aircraft in the United States. Embraer also announced it will distribute approximately $1.6 billion in extraordinary dividends to shareholders and estimated it will have around $1 billion to support new growth initiatives, defending in a presentation to investors at the Brazilian Securities and Exchange Commission (CVM) that the “new Embraer” will be a valuable asset to its shareholders.